If you have upgraded to Windows 10 recently and if you happen to be in India then by default the Windows 10 version will select Hindi as your preferred language. Now everyone in India may not know Hindi (read/write) though it is an official language (not national) of the country. 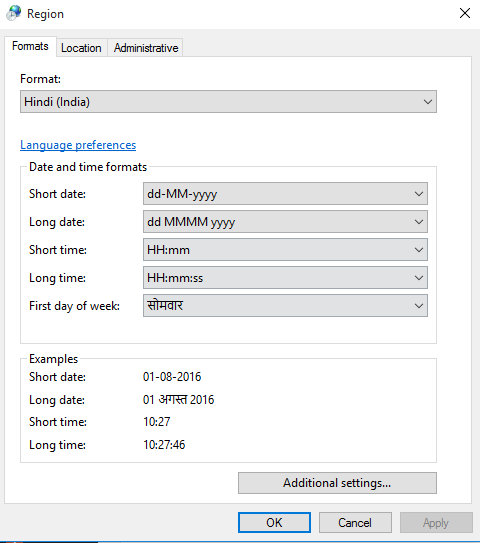 Now if you want to change your preferred language from Hindi to English in Windows 10 here is how to do it. Apart from settings the preferred language in Windows 10 as English there a couple of more functions for which you may have to change the language preference including Date and Time settings in Windows 10, web browsers such as Chrome language preference, etc. manually. As changing the preferred language for PC will not be applied to these settings. In today’s post, we will learn how to set English or any other language as a preferred language in Windows 10. Also, I will also show you how to change language preference for date and time settings in Windows 10. Changing date and time language setting in Windows 10 would only take a minute or so. So let’s get started. Click on Date and Time stamp that you can see at the end of the Taskbar. When the Date and Time stamp opens, click Date and Time Settings. It will open Time and Language tab under the main Settings window. Now scroll down and go to Related Settings. From here click on “Additional date, time and regional settings”. It will open Control Panel’s Language and Region option. Under Region section, click on Change date, time or number format. It will open a new dialogue box with Region settings. Under Format tab, click the Drop-down menu button and select the language that you want to set for Date and Time settings. In my case, since I want to change the date and time language from Hindi to English, I will select English India. After selecting your preferred language, click on Apply and then on OK.
That’s it! You have successfully changed the date and time language to English from Hindi. If you want to change Windows Display language or what is commonly known as the default language in Windows 10, here is how to do it. This can come in handy if your Windows 10 PC came with English or Hindi as the default language and you want to change it to something else or may be your national language. In such cases, here is how to do it. From settings, click on Time and Language. Next, go to Region and Language tab. Here you have the option to set your country or region. Below it, you can see Languages option. If you want to add a new Language click on the + Add a Language button. 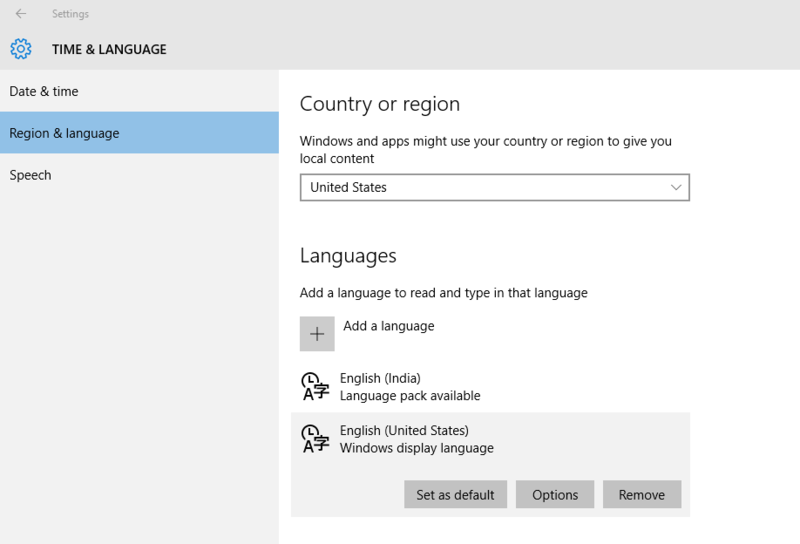 Now select the language that you want to set as Display language in Windows 10. Once selected, you may need to download the selected language pack. So, click on the selected Language, click on Options and download Langauge Pack. Once the language pack has been downloaded, the next step is to set it as the default language. To do this, click on the selected Language and select set as Default. That’s it! You have successfully set your preferred language as the display language. Thanks! Easy to follow and precise instructions.